Stucco has given architects, builders and homeowners the opportunity to design exteriors with character and the freedom to create any style they want. Limitless colours and a wide range of textured finishes enable you to highlight the strong points of your design for a strong visual impact. 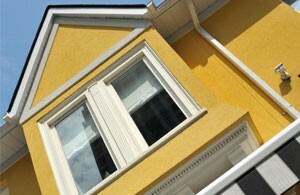 In addition, stucco exteriors provide your home with insulation benefits and enhanced durability of more than 50 years. Choosing the colour and texture of stucco needs careful thought. Plan ahead and talk to your contractor about the look you want to achieve. There are many different techniques used to apply stucco. The finish/texture you select determines the application process. Let architectural style guide your colour choices: For Mediterranean-style homes, whites, browns and oranges work best. Victorian architecture on the other hand makes a dramatic impact in white with black or grey trims. Remember some thumb rules when choosing a shade for your exterior walls. Be inspired by your travels: You can pick creative and unique ideas from your travels to different cities or countries. Whatever you choose, maintain a balance with styles in your neighbourhood, especially from the resale point of view. Not everyone wants a boldly-coloured home. For decorative finishes, let nature inspire you: Textures give your home depth and character. With the right combination, stucco can be made to look like wood, brick, masonry, poured concrete or even sand. Be inspired by the natural elements around you, like a sand-finish for a home near a beach. Also keep in mind these pointers. Venetian style suits larger areas but tends to be overwhelming in smaller areas. A marble coat finish is very popular in Toronto and has a traditional look. The installers at Platinum Stucco have extensive experience working with different architectural styles and textural finishes. We can help guide your choices for stunning results. Being manufacturer-trained, we will also ensure it is done correctly so that your home looks beautiful and the stucco finish lasts for years. To learn more about the colours, designs and textures we offer, call Platinum Stucco (416) 731-8600 or request an estimate online.